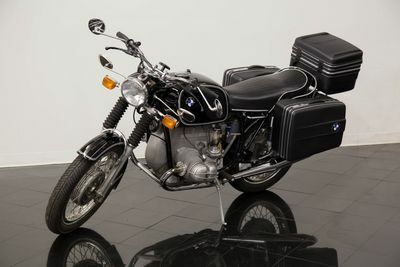 Beginning in 1970, BMW introduced the /5 models in three forms; 500cc (R50/5), 600cc (R60/5), and the 750cc (R75/5). These were the first motorcycles built entirely at the Berlin, Germany plant and stayed in production for only 3 years before revisions were introduced. All of the /5 models have both electric & kick starters, air-cooled four-stroke opposed twin cylinder boxer-style engines with hemispherical combustion chambers, 4-speed transmissions, and shaft driven power to the rear wheel. All models were equipped with telescopic front forks, tachometer, 12-volt alternator charging systems, and turn signals. The largest of the bunch, the R75/5 was equipped with larger bore specs and bigger Bing 32mm carburetors to produce 50 horsepower, and an achievable top speed of 110 mph!